We are exhibiting at SITS 2019 - Excel London - Meet us there! We are exhibiting at SITS 2019 – Excel London – Meet us there! 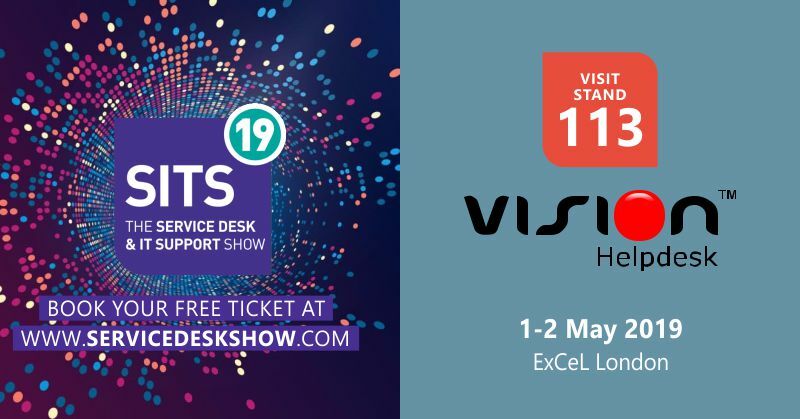 We are exhibiting at SITS –The Service Desk & IT Support Show takes place on 1-2 May 2019 at Excel London. SITS, is the UK’s leading event for IT Service Management and Support professionals. Recently, Vision Helpdesk has received PinkVERIFY™ 2011 certification for 6 processes – The software is officially certified as ITIL® compatible by Pink Elephant, a premier global training, consulting and conference service provider. Certification Confirms Vision Helpdesk – Service Desk Software’s Compatibility with Best Practice ITIL Standards. Come and see us at SITS 19 expo – Stand number 113. The last admission is before the 1 hour of the show end time. For booking your FREE Visitor Registration Sign up here now.